Rättyä's solo accordion breathes new life into 16 sonatas. The monochrome originals glow with colours of wind ensemble, voice and keyboard, superbly bringing out Scarlatti's nimble wit. The Finnish accordionist Janne Rättyä is regarded as one of the most successful classical accordionists. 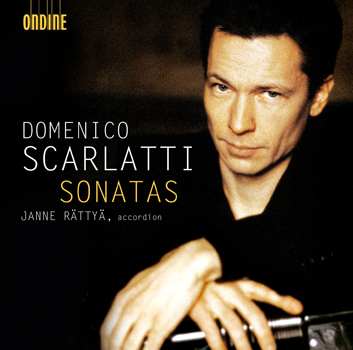 His second solo release for Ondine contains Sonatas by Domenico Scarlatti (1685-1757). He performs as a soloist and chamber musician throughout Europe, in the U.S. and Asia. He has appeared with musicians such as Jorma Hynninen, Pekka Kuusisto, Martyn Brabbins and Patrick Gallois, to name but a few and has appeared also as a soloist with many Finnish and foreign orchestras. The accordion, in Janne Rättyä's hands, seems capable of an aesthetic feat. The nuanced attention to sonic shape and the gentleness with which Scarlatti's articulations unfold reveal the stunning range of colour and affective colouration of Scarlatti's sonic ventures.